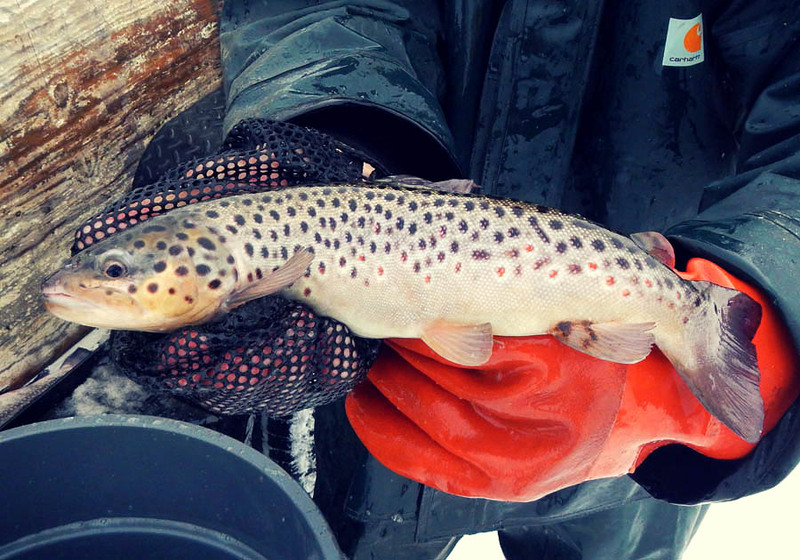 HINCKLEY, OH – This week I had the opportunity to observe a few Cleveland Metroparks trout stockings. This was the final of two rounds of winter trout stockings that occurred at Wallace, Shadow, Judge’s, Ledge, and Ranger Lakes. I suppose I will state the obvious, now is the time to get to any of these lakes for this awesome annual fishing opportunity. Along with the sheer numbers of fish, there are some exceptional individual specimens that are worthy of trophy status in anyone’s book. If you read this post in it’s entirety, I will elaborate more on that. A net full of memories waiting for skilled (or lucky) anglers! I was surprised that the stocking of trout actually was quite laborious. 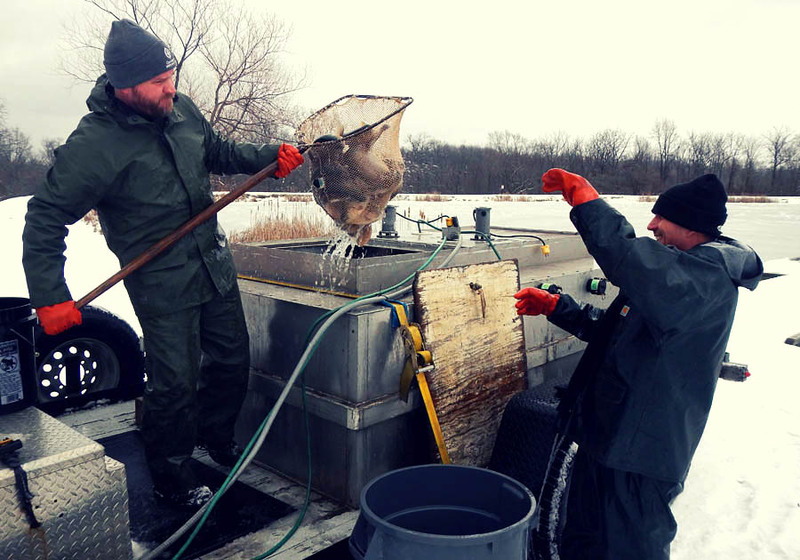 It involved manually netting the fish and then lifting them into a large rubber trash can. 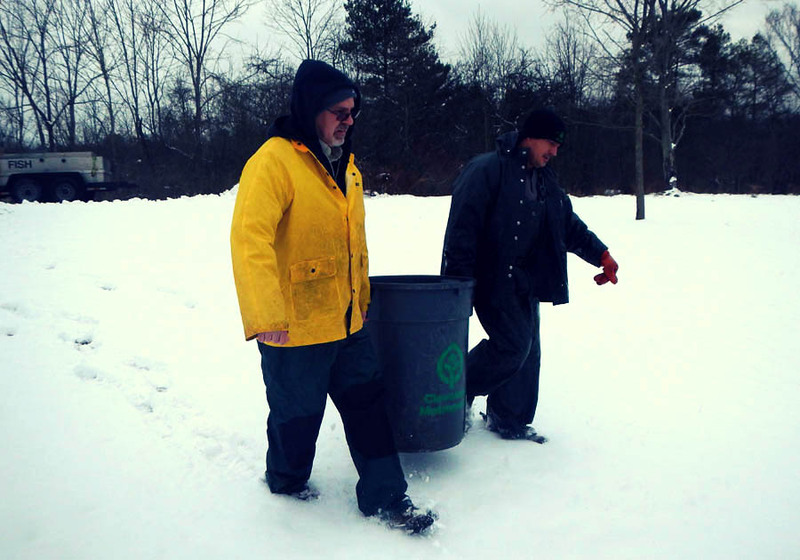 After that, the trash can full of fish and water has to be carried down to the water for the release. I’m certain many of you assumed that it was just a tank that pulls up to the lake with a giant hose that shoots them in. I myself, assumed that from media I had seen online, and from watching an ODNR stocking some years ago at Swanton Reservoir in Northwest Ohio. While it does seem like ‘fun’ work, it truly was work. I only assisted on a couple trips down to the water and my back let me know it was work! There wasn’t a single fish that I observed that wouldn’t have put a smile on a fortunate angler’s face, but there were some that would be extremely special catches. 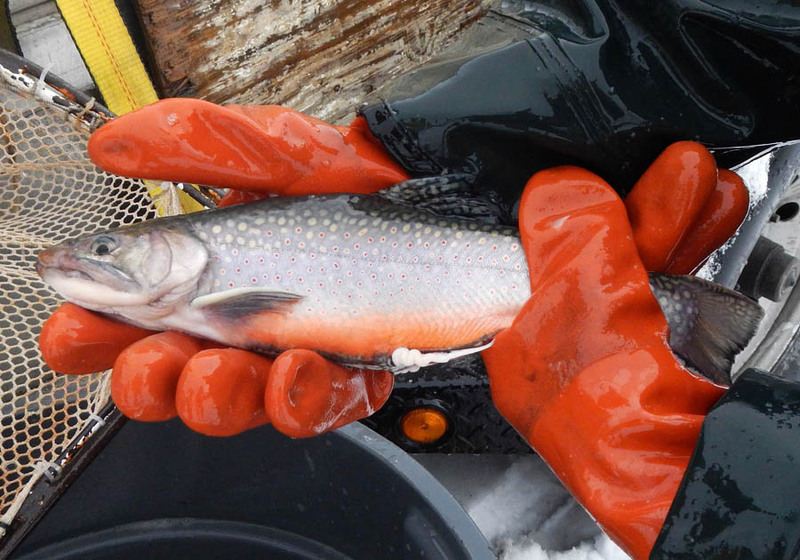 This included some Brown and Brook Trout, some Golden Trout (only at a few locations, not all lakes), and some of all species that were substantially large. While my personal target would be these special species stocked in lower numbers than the Rainbows, a giant Rainbow would certainly be exciting! I am always impressed by the overall quality of trout that the Cleveland Metroparks stock, and this round was no exception. I pray some of these fish have a future encounter with me in the coming weeks. I remain grateful to the Cleveland Metroparks for their efforts to provide recreational opportunities. Specifically, their associates like Michael and Owen who carry out the mission so well. They are not simply astute and credentialed in their chosen field, but passionate fisherman too. I am certain this contributes to how these lakes are managed so successfully. I hope all of you get a chance to target these fish and feel free to shoot me an email about how you do or leave a comment. 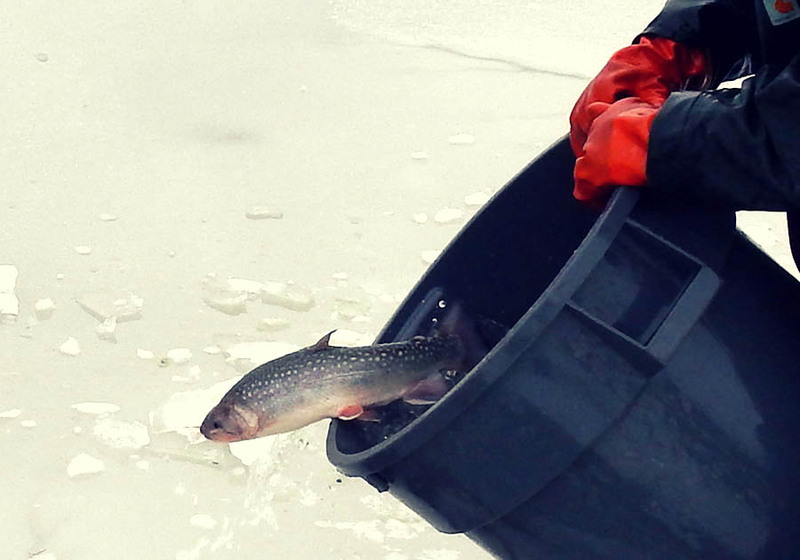 Don’t forget to visit the Cleveland Metroparks Fishing Blog to get fishing related news and view some of the catches. 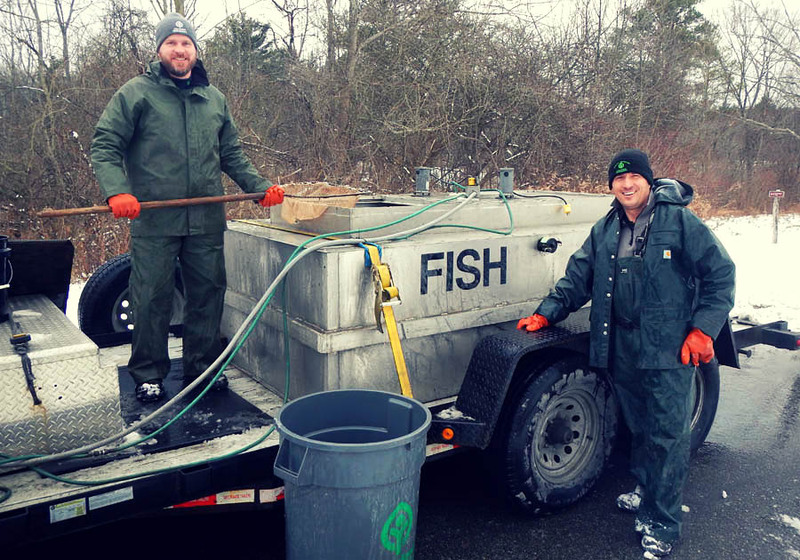 Finally, please consider making a donation to the Cleveland Metroparks Fishing Fund if you want to make a monetary gesture of gratitude – that also helps continuation of programs like these trout stockings. 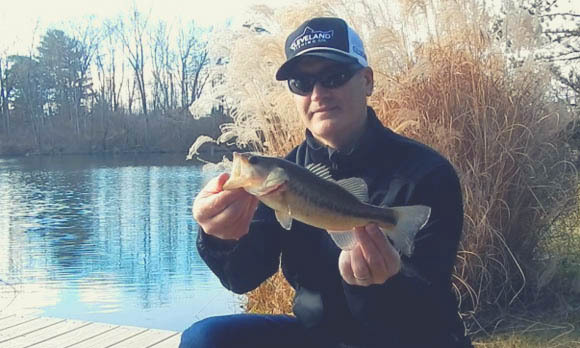 MEDINA, OH – The unseasonably mild winter had me start the year with several trips to various local lakes for open water fishing with my son. Two trips yielded plenty of willing Largemouth Bass who were quite spirited in fight considering the time of year. 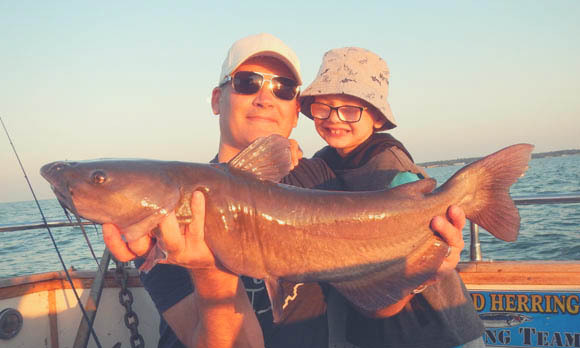 While nothing overly noteworthy stands out, I just enjoy spending time with family and the simple joy of catching fish. Open water bass fishing in January?, I’ll take it! The above fish was pretty representative of the catches. No giants, just good numbers providing plenty of fun. I even brought the 4 wt. fly rod and nabbed a few on a minnow pattern. It may not look like I am having fun, but this is usually what I look like hoping the camera works right, everyone is actually looking at it, no one at risk of getting a hook in them, and the concern of getting the fish back in the water quickly. I always try my best to demonstrate good ethical fishing and that most often includes catch & release. Along with enjoying our resources, I nearly always have conversations regarding responsibility. 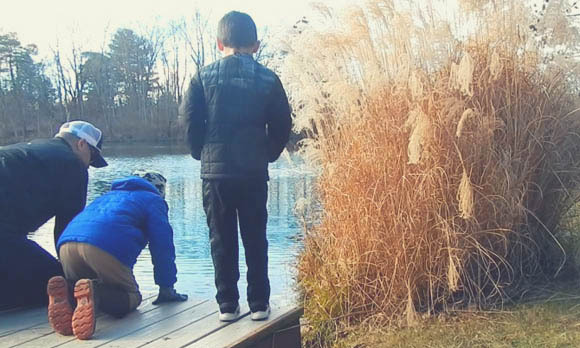 I loved this shot of my son with his cousin watching a bass swim away. 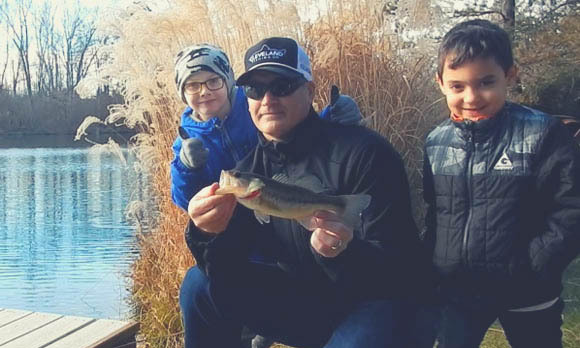 While the first fishing of 2019 may not be that exciting to most… as a dad especially, I just love these simple fishing trips. 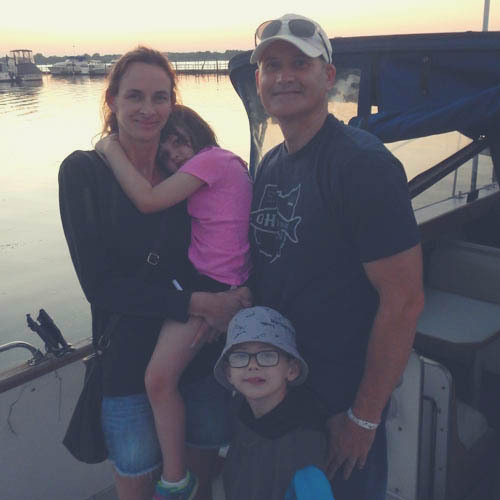 MARBLEHEAD, OH – As part of a family mini vacation to the familiar stomping grounds around Ohio’s central coastline, I thought I would take the opportunity to try Bryce’s ‘sea legs’ out. As much fishing as Bryce and I have done together, it’s never been from a boat. 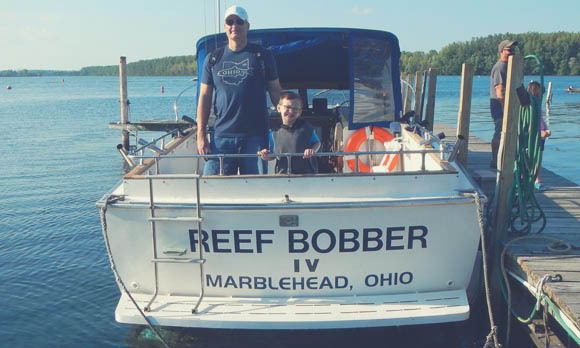 The fishing trip was somewhat short notice as I had randomly gotten an ad in my Facebook feed from Rock Harbor Cottages & Reef Bobber Charters that seemed perfect. It was offering a couple hours of evening fishing for a very reasonable rate. What better way to see how prone Bryce would be to sea-sickness? !, no huge investment if he was miserable, yet plenty of time for some fun if it went well. I’m not even going to attempt to build suspense (okay maybe just a little because their was a big fish), everything exceeded all expectations! Weather was amazing, Bryce wasn’t sick at all, the fish were biting, and Captain Brad was fantastic. 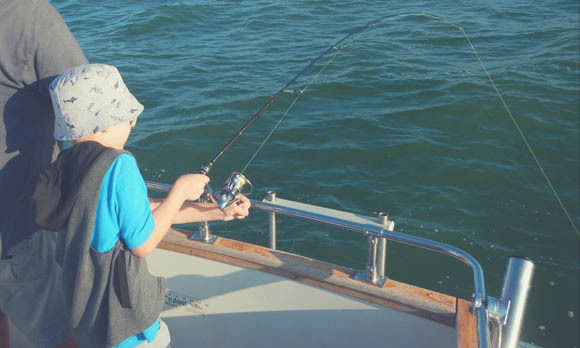 For a bit of a novelty type trip that wasn’t high dollar, I was amazed how hard the captain worked – some casting instruction for my son, would do a long cast and let him reel in, worked hard for his own hook ups and hand the rod to him, set the boat up multiple times for new drifts. All I can say is that I was impressed. 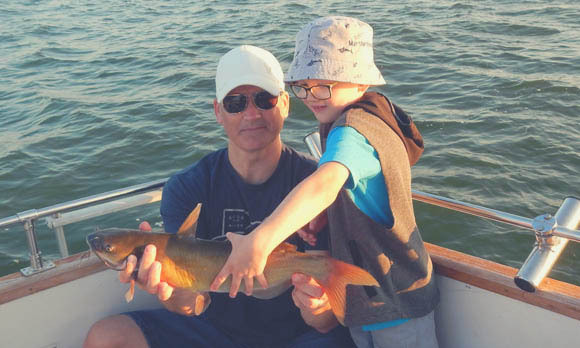 I helped Bryce too, but admittedly haven’t been able to fish much, so I enjoyed that the Captain’s efforts allowed me to do a bit of fishing too. I had expected to need to be ‘hands on’ with Bryce the whole time. Yep, there was a big fish story! I’ve fished with professional anglers that have explained the editing process often used when they record fishing shows. I mean do you really think every time they do a show the best fish is magically caught in the last 5 minutes before the episode ends?! Well our trip really followed that format without any editing… we ended on a couple very high notes. As we all were satisfied that we had achieved our goal to simply go out and catch fish, whatever was biting regardless of species – we would be treated to a giant fish hookup. Bryce was already tired from bringing in many fish and this one would take everything out of him. After 5 minutes of gaining ground and then hearing the drag scream – he asked for some daddy help. I was happy to oblige as I really wanted to see what it was. I also will say I didn’t do any better than him at controlling the fish, but simply had the stamina to wear it down. When I was able to finally get it close enough to see, we all were I awe of the giant catfish. Captain Brad did an expert net job once I finally managed to get the feisty monster to come head first towards the boat. He also took some great photos for us. 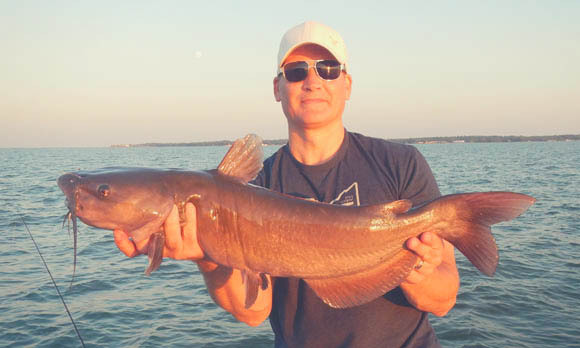 At 30″, I don’t recall ever catching a Channel Catfish any bigger and certainly none more memorable! After the big fish, we were pretty much ready to head back to dock. In yet a another unexpected blessing, I felt the tug of a fish and a completely different feeling fight. I was kind of glad Bryce was tired so I got to bring in the decent sized Walleye. A cool toothy fish was a great end to the night and Bryce wasn’t too tired to steal some glory with a picture with it. 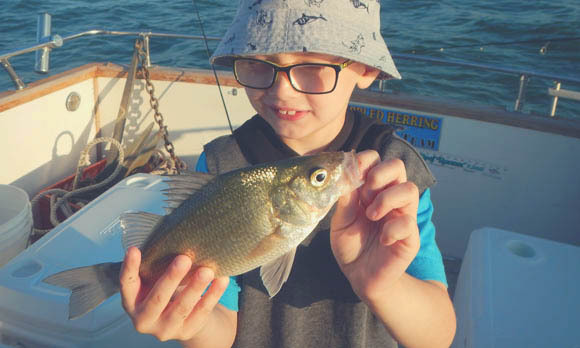 I know this post isn’t about filling a cooler full or tasty Walleye or Perch… or even targeting the amazing sport fishery of Smallmouth Bass that Lake Erie offers. 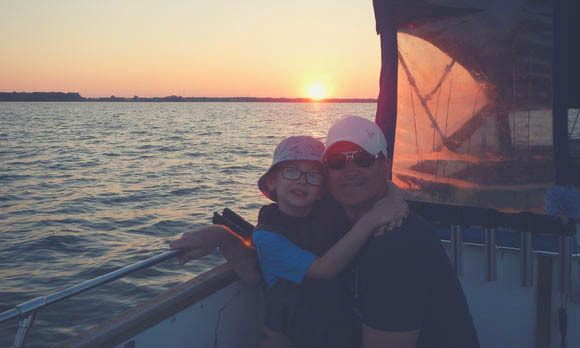 This really was a more personal post regarding a father getting to see his son catch fish on the beloved big pond and hopefully shaping memories of a great childhood. 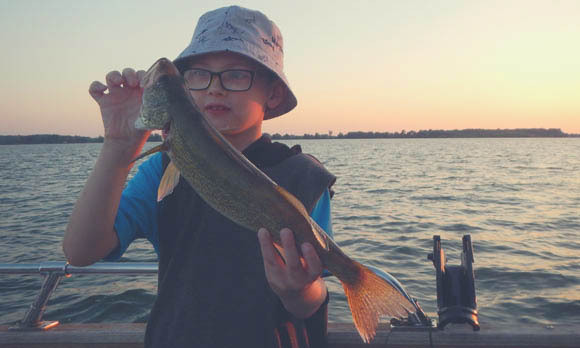 I hope one day he will have more days fishing on the lake that he could ever count or recall – but would know the first time. My daughter had well established before the trip that she was not interested in going on a boat yet. At 4, just a little scared despite loving the water. I was thrilled that she was willing to get on the boat at pick up, a good first step. It also gave me the chance to get all of us in a picture.